Quinoa. Salad. Two words that strike boredom and possible fear in your average lunch-goer. 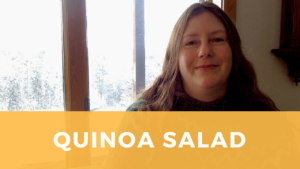 I was skeptical of quinoa myself, at first. But I’ve found it to be a versatile and easy-to-make grain that plays well with a range of other flavors. Use the recipe below as a starting point, and experiment to create the flavor combinations you like. Makes 4 lunch servings or 6 side-dish servings. 3 – 4 cups vegetables. I like carrots and celery in the summer, and roasted sweet potatoes or delicate squash mixed with Brussels sprouts or broccoli in the colder months. Salad dressing or sauce to taste. Try Italian vinaigrette, creamy goddess dressing, or tahini sauce, or your favorite marinade or sauce. Cook the quinoa as you would rice, either on the stove top or in a rice cooker. Meanwhile, cut the vegetables into bite-sized pieces if raw. For roast vegetables, I’ll usually make a large batch to go with roast chicken or another entree, and set some aside for this recipe. In a mixing bowl or storage container, combine the cooked quinoa, beans, and vegetables, and pour over 2-3 tablespoons of sauce and toss to combine. Taste and season with salt and extra sauce as you like. You can then portion this out into individual containers for a quick grab-and-go lunch.